I’m a big fan of Chip and Dan Heath, bestselling authors of Made to Stick (which explained why certain ideas catch on while others die), Switch (Which showed us how to make changes at work and in life), and Decisive (which explained how to make better choices). 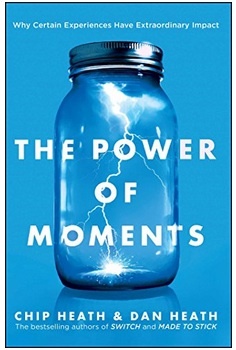 As of today, they just launched their newest book, The Power of Moments: Why Certain Moments Have Extraordinary Impact. In business, the whole notion of creating an exceptional customer experience (CX) is at the top of everyone’s minds. And some have done a great job at defining some basic attributes. (For example, see Lior Arussy’s book, Exceptionalize It). The Heath brothers take it one step further to provide further ideas to springboard and implement CX thinking. It certainly has got my brain thinking! In my life, I can also see how these principles apply. Many years ago, after my second child was born, a dear friend shared her secret to raising great kids. She said, “Your job is to make positive memories. As they get older, that’s what they remember.” And now that my kids are grown and flown the nest, when I asked them, “What do you remember about your childhood?” they replied some simple things – like making sure I made a favorite chicken buffalo sandwich for school. I never understood how that was important, but now I do (hint: it relates to a transition and connection). So if you want to be more intentional about making magical moments at work and in your life, I highly recommend this book. Posted in Reviews on by Kristin Arnold. ← Why Do Leaders Fail?